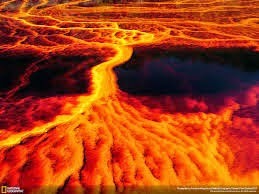 When going to Rio Tinto, your likely to first notice they're red stained rivers, resulting from the very high iron count in the water. In ancient times Rio Tinto was used to mine for copper, silver, and gold. As a result of this, it is know for its very high acid count. There is alot of scientific interest in the river due to extremophile aerobic bacteria that live in the water. These life forms are believed to be due to the high acid content that lives in the water. This river is important because it provides scientists a place to research due to it being analogous to other locations in the solar system thought to contain liquid water, such as subterranean Mars. In February 2005, two NASA scientists reported that had very strong evidence that life was present on mars. Then later, NASA officials had denied the claim and one of the scientist backed off from her initial assertions. The Rio Tinto, a 100 km long river in Southern Spain that originates in the Sierra Morena mountains of Andalusia. The water of the river which flows from the city of Pena de Hierro to the Atlantic Ocean in Huela is red in color because of high concentration of ferric iron. The river has serious environmental problems due to heavy concentration of metals and low pH. In the last 5000 years, the site along the river has been mined for copper, silver, gold, and other minerals. Iberians and Tartessians a group of people in 3000 BCE began mining the site which was later followed by the Phoenicians, Greeks, Romans, Visigoths, and Moors. The mines were rediscovered in 1556 after a period of abandonment. In 1724 the Spanish government began operating those mines. The Río Tinto is very famous for being very acidic (pH 2) and its deep reddish hue is due to iron dissolved in the water.